Father’s Day is coming up this month. Like it or not. And since this is the first Father’s Day ever that I am actually on the receiving end of things… wait… we didn’t tell you guys yet? I guess we didn’t. Double Danger is about to get a new team member… you can call us Triple Danger from now on (thanks FB & Twitter friends!). OK – enough about me/us – let’s talk about potential gifts for your BBQing Father this Father’s Day. These are not in any particular order – just gathered… so don’t think #1 is better than #10… it is all the same. I’m a nerd when it comes to BBQing. Hell, I’m a nerd when it comes to anything. I am a computer guy, a guy that likes badass toys (who doesn’t right?) and so even w/ something as simple as a thermometer – I think no differently. This is a great tool that makes sense when you are BBQing because you need to know how hot something is instantly – you need to check surfaces while staying sterile… so nothing makes more sense than this lil dude! Is your Dad a tail-gater? Is he one that likes to go camping? One thing every man needs is a portable grill of some kind. You can’t really drag your big pit around in the back of your Expedition for 4 hours (right after cooking on it) and expect to be friendly again w/ the folks having to travel w/ you… can you? Well I used to – hell I did not to long ago, but I’m weird. You don’t want your Father to be weird do you? He already is? Well… nevermind. Seriously, a portable grilling setup is a great gift and can be used for all kinds of goodies. Want to eat some hot dogs/hamburgers/armadillo eggs/brats… you got it. For portables – you gotta hit up Coleman – the maker’s of the original green gas stove (if you want to go gas). If you want to go charcoal – then definetly go w/ a Weber. I have been a fan of this book for a long time, so it is a no brainer for me to recommend it to anyone. It takes BBQing back to the basics, tells you that you don’t need fancy racks & contraptions to make good BBQ – just patience, smoke & beer. Ok – maybe I added the beer… but still. This book will help your dad become a great when it comes to the ‘Q. I’m sure he already is… but this can actually make him better. You thought that this was just for beers/wines? (that is later in the list) Nah – they have it for everything these days. If your dad likes to play around w/ different Sauces or he is a nut when it comes to new BBQ tools – well… do we have the thing for him. I have recently stumbled across a BBQ Sauce or BBQ Tool of the month club that gives you just what they claim, a bbq sauce a month or a bbq tool a month. You can sign up for different lengths of time – 3 mth, 6 mth, 9 mth, 12 mth. Ok – so if you don’t know Stubb’s (whether you are from Texas or not) – you don’t know BBQ. C.B. Stubblefield is a legend in Texas BBQ and his sauces, rubs & marinades are epic when it comes to BBQ. If you are ever in Austin – you HAVE to stop in and eat at Stubb’s and experience the atmosphere that makes it famous. If you can’t make it to Texas – you can buy Stubb’s sauces, rubs & marinades online or in your local stores. I suggest grabbing a little bit of everything and creating a basket/gift pack for your Dad this Father’s Day – so he can experience the range of flavors Stubb’s has to offer (and of course everyone else will get to too). If your Dad is already a nerd and has an iPhone – then you might just want to fund his addiction w/ a few BBQ/Grilling Apps. Weber has an awesome grilling caddy app for the iPhone called Weber’s On The Grill. It is the most talked about grilling app on the market – and hey – it is made by Weber… so it has to be legit right? Right. Over 250 Classic Weber recipes and also ideas for rubs/marinades and tips to keep you grilling all year long! BBQ/Grilling without beer? Never. Or at least in this household. I hope I don’t offend those non-beer drinkers out there w/ this suggestion – but I figure you have 9 other choices to choose from, so why not. So if the old man likes to share a cold one while he is doing his grilling/bbqing – then this is a perfect. You can search around for different options on this one, there are tons out there – but Beer of the Month clubs have been around for a long time… so try to find the one that works best for your dad. They have all kinds, imports, micro, domestic, local – whatever you choose… check out the specifics to be sure you aren’t getting into something you don’t understand. These are one of my new favorite grilling accessories – especially since we are gardeners… it means we can use our fresh veggies on the grill – in a super cool way. These things make so much sense it is dumb that it has taken this long to come up with. Firewire is a skewer… that is flexible. Need I say more? So instead of all these skewers taking up a big section of your grill, you can actually weave them around your already-grilling-greatness. Awesome right? Right. So next time Dad says he is going to throw on some steaks (when really he should be eating his veggies too) – you can remind him of your Father’s Day gift – Firewire Flexible Grilling Skewers. So it happens to all of us, we plan a to grill – we don’t get started when we should. Before we know what happened… it is dark – and you can’t see what your doing anymore. 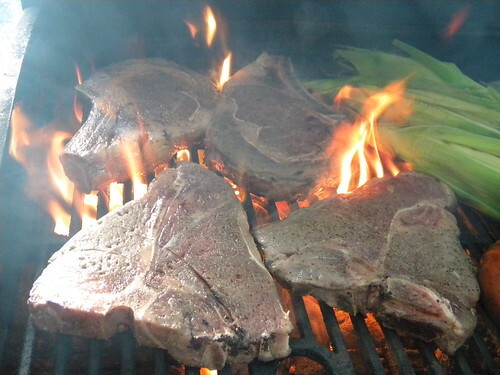 Dad does his best to get the steaks cooked right – but honestly… what can you expect when he is doing it blind. So instead of eating burnt steak or raw chicken – get your old man a grilling light. The one I got this past year actually has these heavy duty magnets on the bottom that cling to your grill so you don’t have to worry about dicking around w/ a clamping mechanism or some sort of screw down crap that always gets loose. So be sure you get a nice quality one that will get the job done for Dad this Father’s Day.